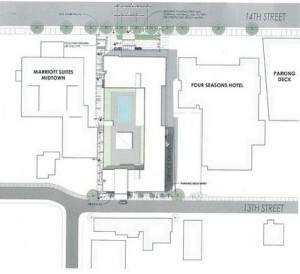 New details and renderings have emerged for the Marriott-driven dual-branded hotel slated to rise on a parking lot between 13th and 14th streets next to the Four Seasons. Designed by Cooper Carry, the hotel is slated to have around 300 rooms, according to a report by the Atlanta Business Chronicle. On 14th Street, an AC Hotel will rise 10 stories, while on 13th Street a five-story Moxy Hotel — Marriott’s latest brand, tailored to millennial tastes — will sit atop six floors of parking. Plans indicate a much-needed pedestrian connection will cut through the block, linking the Woodruff Arts Center area to Crescent Avenue. While this will be the first dual-branded property by Marriott in Atlanta, the Catdog hotel arrangement is nothing new; a Hilton Garden Inn – Homewood Suites hybrid at 10th and Williams streets broke ground four years ago this week. The Marriott project will be developed by Noble Investment Group, and is just one of more than 40 projects planned or in development in the area. The Moxy will be the first of its kind in the Atlanta market, but the AC will be the second in the city, with the first currently rising on Wieuca Road at Peachtree Road, next to Phipps Plaza. No word on an anticipated completion date.